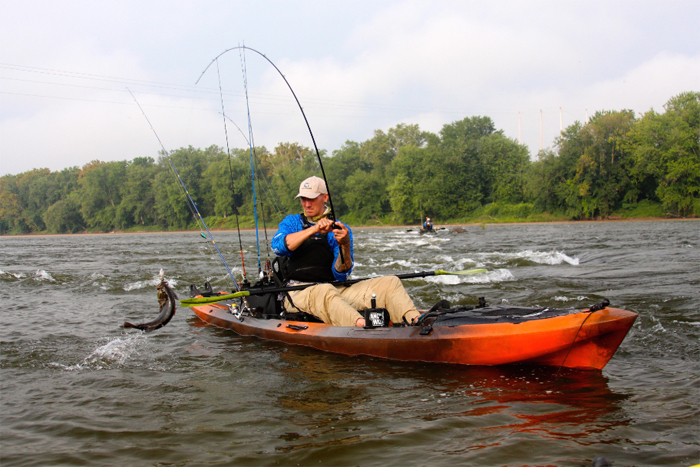 Wilderness Systems, the makers of high-performance kayaks for passionate anglers, recreational boaters, and expedition paddlers, announced today the addition of a premium accessories collection to compliment its award-winning kayaks. Since 1985, Wilderness Systems has chased perfection – creating innovative kayaks tuned for performance, premium outfitting, and stunning quality. Wilderness Systems applies these same high internal standards to its new accessories, ensuring each design gets you where you want to be: on the water. The star of Wilderness Systems’ new accessories collection is the new Motor Drive, a drop-in electric motor with a plug-and-play design that harnesses Torqeedo technology. The Motor Drive pod takes kayak propulsion technology to the next level with max cruising speeds of up to six miles per hour, a range of roughly 20 miles, and a rechargeable lithium battery that lasts up to eight hours. It’s the perfect hands-free addition for anglers or recreational boaters who want to cruise the shoreline at a set speed and direction while casting or resting. Paddlers can choose from an extensive lineup of premium, model-specific dashboards, storage and hatches, angling outfitting, rudder kits, seat outfitting, and custom-cut conceal pad kits. Popular accessories include the Flex Pod OS Console, a must-have housing unit for electronics integration; the AirPro 3D seat, a stable, elevated perch for anglers; and the Stabilizer Bar for lean-on stability while casting. The full Wilderness Systems’ accessory collection will be available at retail stores and online in fall 2015. For more on these exciting and innovative new products from Wilderness Systems, visit www.wildernesssystems.com.